A wide range of standard aperture sizes are available, suitable for ready to eat food products application the machines are customized as per product application requirement. Various models are available for different products. 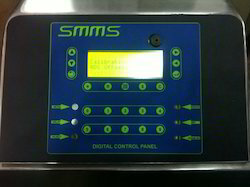 Combine with IP 65 grade control panel for complete protection against dust and moisture. 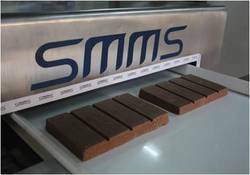 With high quality robust design, SMMS's Chocolates Metal Detector is specially designed to check minute metal contamination in chocolates. The Machine is passed through stringent quality checks before delivering to client. With very high product signal the machine is designed in a way to give high performance. 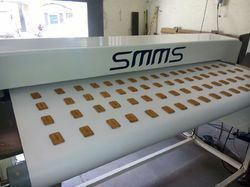 SMMS metal detection technology provides Metal Detector for Biscuits, this metal detector can be installed after oven on cooling line on online application, on metal detection this Metal detector for biscuit will automatically reject the metal contaminated biscuits through flap type rejection system.As a compliance machine, Our Metal Detector for Biscuits delivered equipped with food grade material to have full compliance with Food Processing Norms. Compatible to high temperature factory conditions. 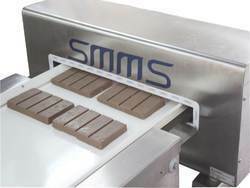 We are manufacturers and exporters of large quantity Metal Detector for Chocolates, We provide best metal Detection in Chocolate manufacturing Process even with high product signal, We understand the problems faced by chocolate manufacturing units and have developed our Tailor made, High Compact and New technology model to minimize product effect and provide high and accurate detection. Widely used in Chocolate Manufacturing Units, Chocolate Packing Units, Loose Chocolates, Aluminum Foil Wrapped Chocolates, Chocolate Jars. Stainless steel high grade used for easy moving of product and easy cleaning after per batch. Easy to fetch reports at supervisor level. 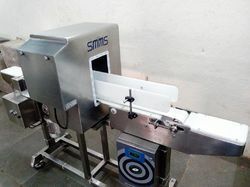 SMMS engineering is into manufacturing and suppling Metal Detector for Ready to Eat Food Packets manufacturing industry, As per strict quality check industry norm we provide a compact and sturdy design to meet industry standards, Our Metal Detector can be customised as per process requirement, even with large aperture we have best in class metal detection. Validation kits along with validated test probes with certificates supplied free of cost with Machine. 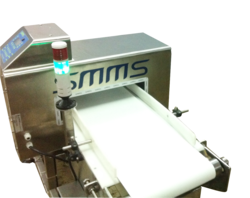 SMMS's Metal Detection systems specially designed for checking Ready to Eat Packets Metal Detector comes with international quality design to check minute metal contamination in pouches. Ideal for Biscuits, Chocolate Packets, Ready to eat Meals, Snacks. Our state of art design Pipeline Metal Detector suitable for liquid and viscous products, Sauces Metal Detector pastes, slurries and pulps is equipped with a 3 way valve rejection system, this high accuracy equipment delivers accurate detection and rejection with minimum product wastage. In compliance with HACCP norms. 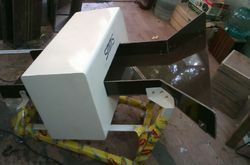 Candies Metal Detector, ideal for checking candies and toffees a compact design with minimal maintenance. Delivers high Detection even with high product flow. SMMS Ferrous Metal Detector is a specially designed machine for Aluminum Foil Products, These machine accurately detects Ferrous contaminants in aluminium foiled products, widely used in aluminum foil packed products. Highly compatible to high flow factory lines. Accurately detects and rejects ferrous contaminants in foiled products. We are in manufacturing and supply of Metal Detector for Icecream, We having supplied to large Ice Cream Manufacturing units understand the requirements of the ice cream product line and supply the machine compatible to factory environment, We have tailor made machines for each product line delivering precise and accurate results. We offer wide of Metal Detectors for Packed and Ready to Eat Food. A specially designed Model for packed food, ready to eat foods, Biscuits, Confectioneries & Frozen Sea Foods. These are Tailor made machines as per various applications. With different types of Rejection Systems. We offer wide range of Coconut Powder Metal Detector. Bags checking Metal Detector, these models are ideal to check product filled bags like coconut powder, flours, sugar. With high detection Capacity SMMS's Metal Detector works under high pressure and delivers quality with high level of Metal Detection. We offer wide range of Pickle Metal Detector. Ready to eat industry having stringent quality control protocols needs a compliance machine at par with international standards; Many export houses in Pickle Industry have their major lot in export market, As export norms are very strict the quality control are timely and high level, Our pickle Metal Detector has a capacity to working on continues operation even with different products at one time. We offer wide range of Ready To Eat Packets Checking Metal Detectors. 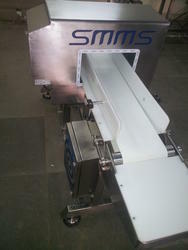 A specially designed Model for packed food, ready to eat foods, Biscuits, Confectionery & Frozen Sea Foods. These are Tailor made machines as per various applications. With different types of Rejection Systems. 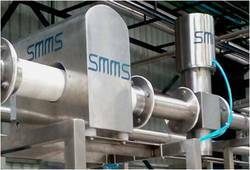 SMMS Bottle Metal Detector is a quality product with robust design to detect metal contaminants in Pet Bottles, Metal detector can be installed after product filling line and before bottle capping line in case or foil capping. Bottle Metal Detector efficiently detects magnetic and non – magnetic and very high resistant Stainless Steel as well with minimum wastage of product, very high sensitivity and accurate detection gives our machines upper hand in market for most trusted brand. Collection of rejected product in safe rejection bin for minimum spillage.